"WHAT IS THE COMPULSORY SCHOOL AGE?" The term ‘compulsory school age’ is the period of time in a child or young person’s life during which a parent or guardian has a duty to provide an education, for example, by sending them to school or by providing home schooling. A child or young person is of compulsory school age either on 1 January, 1 April or 1 September following their 5th birthday, for example, if a child turns 5 between 1 January and 31 March, their compulsory school age will begin on 1 April. The compulsory school age ends on the last Friday of June during the year the young person turns 16, provided their birthday is before the start of the next school year. For example, if the start of the new academic year is in September 2014, and a young person turns 16 in October 2014, then the end of their compulsory school year will be the last Friday of June in 2015 and not 2014. 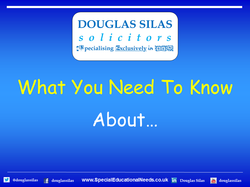 If a child or young person of compulsory school age has been permanently excluded from school, the relevant Local Authority (LA) is under a duty to arrange suitable, full-time education, including from the 6th day of being permanently excluded. Schools have a duty to arrange full time education that is suitable from the 6th day of a fixed period of exclusion. Both schools and local authorities have to ensure that the new provisions are in line with the pupil’s EHC plan if they have one. "WHAT IS THE AGE OF PARTICIPATION?" From 2013, all young people are required to stay in a learning environment until the age of 17, and until the age of 18 from 2015. The age of participation is not an increase in the compulsory school age, what it does mean is that a young person who is over the compulsory school age, but is not yet 18 will have to participate in either some form of education or training. A young person can continue with full time education at either a school or college, they can undertake an apprenticeship or traineeship scheme, they can become employed, self-employed, or they can volunteer for a minimum of 20 hours a week whilst also either in part time education or training.